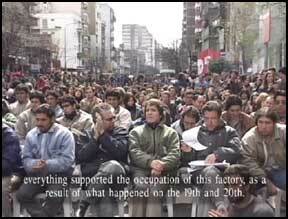 On the 19th and 20th of December 2001, resistance to the neoliberal policies imposed by the IMF and World Bank exploded into rebellion. Thousands of people took to the streets in Argentina, and in more than 100 cities worldwide. This documentary examines these new political forms inspiring further resistance around the world. Produced by Barra Productions and Maite Llamos, Marian Percovich, Juan Laguna, Martin Bergel, Ezequiel Adamovsky, Maria Eva Blotta, & Frederico Sainz. Filmed 2001-2002 in North & South America. 47 mins.